It feels like 2016 just flew by, but not without some highlights. We celebrated our one year anniversary, shared loads of helpful tips and advice on the blog, and welcomed some pretty cool new food trucks to our service. It was a fun year for sure! Thanks so much for following along on Facebook, Instagram, Twitter, and here on the blog. 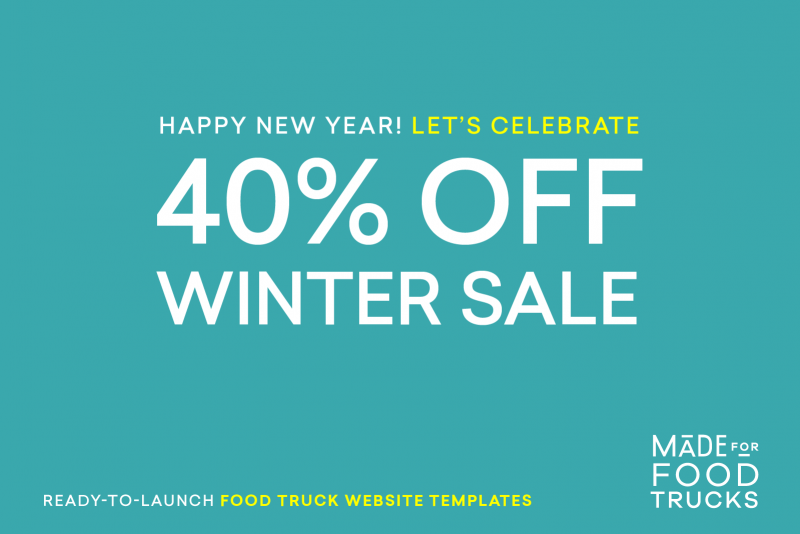 We're so excited to dive into 2017 that we are putting our plans on sale for 40% OFF* for a limited time. We know a lot of your are in your off-season, or trying to tackle your New Year's goals for your business. We want to help by making it easier than ever to finally launch that new website. To take advantage of the sale, simply Get Started by choosing from either the Curb or Parked templates. No promo code or coupon needed. See? Super easy. Have a question or need some help deciding on a template? Give us a shout and we'll assist. So, here's to an amazing 2017. We're looking forward to seeing what you do in the New Year! *40% off discount applies only to your monthly or annual subscription. Does not include one-time setup. Open to new members only.